Umunna, Soubry & Celebrity luvvies launch new campaign! On Saturday in front of an assembled crowd of 1500 people in Camden, London the great figures of the UK establishment assembled. It included well know remain MP's such as Chuka Umuna, Anna Soubry and Caroline Lucas. There was also a sprinkling of 'stardust' with former Start Trek Captain Jean Luc Picard also in attendance. The event has been roundly mocked for the attendance of Patrick Stewart who has recently applied for US citizneship in order that he can take on Trump 'full time'. 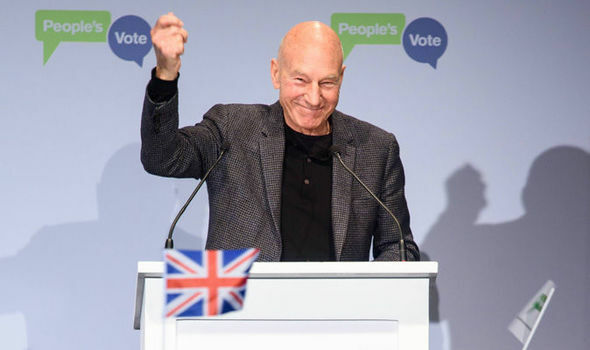 Stewart said in relation to the characters he played: “There’s no doubt that Jean-Luc Picard and Charles Xavier would have voted Remain and I’ll tell you why. Because they are people who believe in the common interest. Who have always had the common interest at heart – not just the elitest few." 'The People's vote' as the campaign is known is backed by Tony Blair and has millions in the bank. Likewise George Soros has given the Gina Miller campaign over £800,000. The are seeking to ensure a vote on the UK's terms of withdrawl from the EU which they hope will then lead to a reversal of the decision by the British people to leave the EU. We need your help at UK Unity. Become a member at just £5 a month and make sure you play your part in helping us leave the EU. Click here now to join up now! If you don't want to become a member then please donate now by clicking here! Read: "Jacob Rees Mogg condemns Enoch Powell speech!"